I have been trying to watch what I eat lately. Kind of a hard thing to do when you are a food blogger. But I am really trying. Not only that but I am getting back into my normal exercise routine. I made it a goal to run two miles a day. I got home from my morning run and it was time to bake these babies. I knew that my boys would love them. 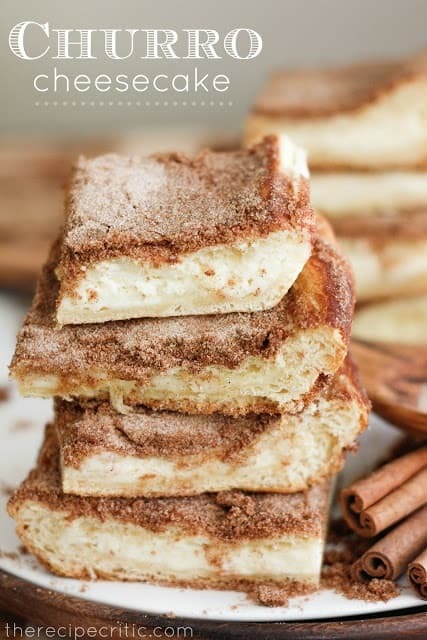 These were so easy to make, within 10 minutes they were already baking in my oven and the cinnamon aroma filled my house. But I was determined to stay strong and resist. I could tell that they turned amazing and I anxiously awaited for my little boy to return home from school. I could tell by his face that they were the bomb and the groaning out of pure delight didn’t help in any way. He said mom, try just one little bite! So I gave in. And two squares later these babies changed my life! I was in churro cheesecake heaven. I love cheesecake anyway, but these were amazing! They tasted like I was biting into a churro and then stuffed with cheesecake made them that much better! These were worth every mile I ran that day! Hi! My teenager has asked for this for her birthday cake. We will be eating them tonight after dinner. If I bake them this afternoon do I put in the fridge or leave out? I can’t cook but made this with my 8 yr old daughter. Everyone LOVED!! Thanks!!! These are truly AMAZING!! AND easy. When I first took them out of the oven I was worried that the crescent roll was overcooked on top because it looked too brown. But I followed the directions exactly and they came out perfectly!!! I served them for my Cinco de Mayo party dessert and they were a hit. I will definitely make this again. It will make quite a lot so it’s good to take for a dessert if you are attending a dinner party. So good!! Try them! Does this need to be refrigerated before served? I am making them in the morning. Does it need to be refrigerated because of the cream cheese? Not sure if the crust will get soggy. Or can it stay out all day. Thanks. Can’t wait to make this. I actually liked them refrigerated! Will they be any good a day later? Thinking about making this for a pot luck. I was wondering should u make this the day of or the day before a party? And should it be served warm or cold? I. Am. Just. Starting. Out. Of. Making. My. Own. Food. My. Had. Brain. Cut. Open. Left. Me. Half. Not. Moving. Now. I. Am doing. Stuff. Myself. If. U. Have. Any. More. Recipes. To. Pass around. Just. Call. Me. Please. Just made this Churro Cheesecake and I must say it was super easy and oh so good!